Once the holidays have come to an end, I long for things to be simple. It feels good to store away the decorations, cook simple food, get back into routine and dress simply. That enamel bracelet is one of my favorites of your collection. It's perfect for a simple--but still gorgeous--day! Dearest MT, although this outfit is simple, you have so much class and are so elegant!!! I am so happy to see your beautiful smile again! Looking forward to many wonderful posts in this very special place that is your blog. P.S. We are scarf twins concerning "La Réale". I have it in light green. I have tried to post earlier but it seems my comments have not gone through. I have only recently fell in love with Hermes wonderful scarves( and bracelets/having slid down the slippery orange slope since the end of Aug when I first found your wonderful blog). I have wanted to thank for sharing your love of these beautiful items and your wonderful sense of style in utilizing them ( for many when they think of scarves,equate them with Grandma and an era gone by & simply can't fathom how they can be such an intergral part of a wardrobe but you show just how they blend beautifully in a modern yet elegant& classic manner). I thoroughly enjoy the capsule wardrobe sections and I do have a request -as you identify in each of the snippets about each item-would you be so kind as to tell what color the new ballet flats(the bi-color ones) are and who makes the stunning "light taupe" coat you wore with your black jeans,boots and rollneck recently? I would dress like that every day through the winter if I could! No matter whether it is glam or casual,you always challenge us to get our best H on ! J'adore this look! Simple perfection!! Dearest Mai Tai, your très simple look is très chic and elegant!! Love your enamel bracelet too and oh, the transformative power of a gorgeous Hermes scarf. What I love most about your posts, Mai Tai, is that you make all your wonderful looks achievable for anybody. Of course you have exquisite accessories, but you make me feel like I too can achieve something similar with my own stuff. 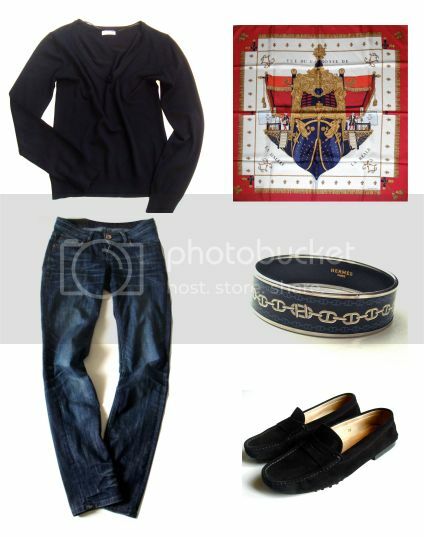 You've shown a possibility and illustrated how a few carefully-chosen accents can lift and transform an outfit. And for that, I'm very grateful. what a simple and perfect outfit! I will be going for something similar today. The Ascot knot works so well with it. I got my first Hermès scarf yesterday!! So today I plan to experiment and study some different knots and tying methods. Your videos are always so clear and easy to follow. Thank you! You've worked your scarf magic again - its hard to believe that you are wearing the same red & blue scarf that you've worn before - with some skillful folding the blue is replaced by the gold and the whole look is changed! Inspirational! I love the simplicity of this outfit yet its made chic, sophisticated and stunning with a simple but perfectly executed ascot knot and finished off by your beautiful smile! Thank you for sharing, I'm looking forward to you performing more magic with your gorgeous scarves throughout 2011 and beyond! Simple yet so elegant and classy. Thank you for sharing dear MaiTai. I love the look, MaiTai. Simple and comfy but also very classy. MT, once again you show that simplest is best! Now I have that scarf on my radar :) Have the bracelet in the rouge H colorway and it is so easy to wear. Looks great when I pair it with the chaine d'ancre silver bracelet. Best for the New Year and 2011 to filled with more fab fashion!! I agree - nice to be back to normal after the holidays. I'm busy making my own capsule wardrobe - am going to keeps some things simple too! So sorry re your previous comments, abgirl! I have had so much spam recently, and your comments might have been filtered out, with me failing to notice. A belated warm welcome to the orange side, and I am honoured to be part of the departure! Wishing you much fun with your new found love, and hope you will continue to enjoy it here. I have two pairs of ballet flats that fit your description, one is brown suede and the other one grey. The tip on both is copper coloured. The coat is by Apostrophe, bought at a George Rech boutique. Lol, dear Suzanne ;-) Isn’t it just one of the most classic winter ‘uniforms’..so timeless and simple. So happy to read your comment, dear Simone, thank you. You have described the esprit of this place so well. Mille merci. And I will go for something similar tomorrow too, dear Anna W! Many congratulations on your first H scarf, getting the first orange silk box home is so very special. Wishing you much fun knotting and tying! Dear M, I appreciate your observation re the tying of the scarf, and yes, it is amazing how different the same scarf can look when knotted in a variety of ways. The Ascot brings out corner symmetry so well, and so it’s perfect for the Reale. Happy Scarf Year to you! Have fun planning and making your capsule pieces, Julia! Thank you, my dear dreamdoll. Hoping to see a pic of you and your CSMC fluid one day, or better still.. see it live! Hi MaiTai, your blog, along with the scarf knotting instructions and videos, is a great resource! I have a blog dedicated to scarf inspiration and will direct my readers to your blog for specific scarf knotting instructions! Your beautiful smile took my breath away, my dearest MaiTai. You have a glow that can illuminate the whole world. I love simple too - isn't it sometimes so comforting. Your La Réale is truly a stunning scarf - love how you've folded it, allowing the gorgeous white and gold portion to reflect your radiance. As mentioned above (and I found the same idea by some of your blog visitors a while ago) - it might be interesting to select some scarves and show what can be achieved by changing the knots - change in colours, style, etc. I used to lack any skills in that area, but started playing with your scarf rings and I feel you might be proud at times of how much I learnt from you LOL and how helpful you scarf rings have been on the way to make some of my scarves small chameleons which transform the outfit. Just an idea, there are many of your posts which could be used for that purpose already. Looking forward to your further posts, whatever they will be about. I am a great admirer of your wonderful blog. There are so many hints how to tie those colourful Hermes scarves. One of my favourites is your last post about this très simple capsule wardrobe. I really love v-neck sweaters. And there, I've got a question. I like wearing v-necks with a scarf following the neckline, with a lower knot. What kind of scarf knot would you recommend for this style? My dear Scarf Enthusiast, Lilian and Anne, I am SO very sorry to come back to your comments so unbelievably late! A warm thank you for your kind words and good wishes, you were so kind to write. Dear Anne, so wonderful to hear that you enjoy my blog, many thanks. Thank you also for the great suggestion, which instead of answering here, I turned into a blog post. Your english is excellent by the way!